We are grateful for support from the Bible Association of Friends of America. John’s Gospel is known as the Quaker gospel because the universal Light is central, extending across all worldly barriers of class, gender, and race. Jesus is a model for us – of humility and obedience. We will read and explore together the spiritual messages of John’s teachings that inspired much of early Quaker spirituality. We will also open up selected topics in more detail, using small group sharing, reflective readings, and prayer time. We will not focus much on doctrine, rather seeking to experience the Spirit by which these words were written, and which is come again to teach us now. David Johnson is a convinced Friend of Conservative nature, a member of Queensland Regional Meeting of Australia Yearly Meeting. 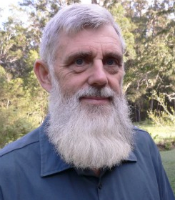 David delivered the 2005 Backhouse Lecture to Australia Yearly Meeting on Peace is a Struggle, and wrote A Quaker Prayer Life (2013), and Jesus, Christ and Servant: Meditations on the Gospel According to John (2017). He was involved in setting up the Silver Wattle Quaker Centre in Australia, as a place for spiritual renewal and nurture. With his wife Trish, he was Co-Director of the Centre from 2013-2014.